$100m KPCB iPhone iFund: Shocking or Marketing? One hundred million dollars buys a lot of iPhones, probably about two hundred and fifty thousand or so. 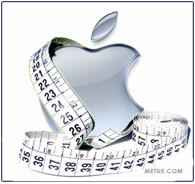 A hundred million also buy a lot of iPhone software development. Just how much will be up to Kleiner Perkins Caufield and Byers (KPCB). As part of Apple’s iPhone Road Map Day on Thursday the Sand Hill Road venture capital firm took the stage to announce the organization of a $100m investment initiative earmarked for developing applications and services for use with the phone. $100m is a lot of money. Pledging it all to software and services built around a single product sounds significant. But while there is no question it is a strong endorsement of the iPhone’s potential, beneath the headlines the allocation may be less significant than it seems. It comes down how venture funds work and a distinction in phrasing between a fund and a focus area. Cell phones are getting more and more sophisticated and along with the changing technologies, mobile usage patterns are starting to shift. 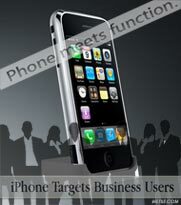 According to a just released report from Pew Internet about 75% of American adults own a cell phone. 58% have used their device for non-voice applications (email, texting, and Internet) and 41% have logged into a mobile Internet connection. Apple and Research in Motion are among the phone makers leading the push to the future but like giant ships passing in the night, they have so far approached the markets from opposite shores; one focused on consumers, the other the needs of corporate business users. Now that is changing. In an increasingly spirited competition both companies are expanding their ambition. Instead of targeting just a segment (corporate/consumer) now they’re both aiming for the entire smart phone market. It’s shaping up to be an interesting battle. 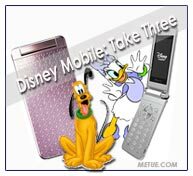 For all the achievements, kid centric, branded mobile phones haven’t been among Disney’s successes. For that matter, all past Mobile Virtual Network Operator (MVNO’s license airspace from other network operators rather than running their own cellular network) efforts, including an ESPN sports themed mobile service, have failed for Disney. That isn’t stopping them from trying again. Somebody in Mouse-land thinks there’s gold “in d’em de’re hills” and it’s just a matter of getting the formula (and geography right). Disney MVNO version 3, was officially revealed Monday. 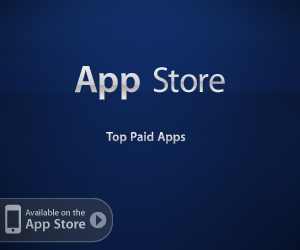 The new service will narrowly target the Japanese market in partnership with Softbank. It will also focus on a new demographic. The attempted acquisition of Yahoo is the big story but in smaller news Microsoft has fortified their mobile software efforts by acquiring Palo Alto based Danger Inc. 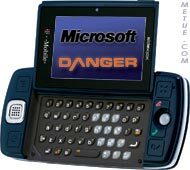 Danger is best known for developing T-Mobile’s Sidekick along with software and services that enhance multimedia and web functionality and cell phones. The company was founded by Andy Rubin who is now heading Google’s competitive Android mobile platform project. With markets in panic mode, the “R” word being used at the water coolers and the Fed pulling the ripcord on an emergency parachute, it was a bad day for any company to release earnings. It was an especially bad day to share any comments that were cautionary, ambiguous, or anything but outrageously optimistic. Apple shareholders paid the short term price. Not five minutes into Apple’s earnings conference call After Hours traders, seizing on cautious, conservative lowered guidance, drove the stock down another ten percent. The unfortunate thing is, the response is extreme, more a consequence of the economic climate than the actual news. The allure of a suspense is irresistible. 50 pages into a good book the outcome may already be foretold but if well done, you anxiously read the next two hundred to find out for sure. Macworld as a trade show has built for itself the same kind of dramatic tension. 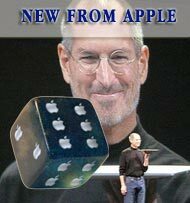 Over the years, as ringmaster, Steve jobs has crafted himself into an impressive storyteller. Legions hang in wait for his word. At Macworld, the lines were long and formed hours early for those anxious to see the live spectacle. At 9:15 PST, following a new Mac vs. PC ad, Steve took the stage. He gave the obligatory recap of 2007, and then launched the crowd into the future. Major news outlets were vastly in attendance. They’ll be covering the announcement all day. Here’s the quick list: iTunes rentals (Check), New Macbook (Check), improved Apple TV (Check), software update for the iPhone (check). 2007 was a banner year. There was the iPhone, a new (and very successful) iPod family, a new and improved iMac, the Leopard update to the OS X operating system and a stock price that’s accelerated like a Ferrari on a track. Now it’s 2008 and Macworld, the trade show that is “Apple’s State of the Union” is just a blink away. Last year’s show revealed the iPhone. “What can we expect this year?” is the question on the minds of many. 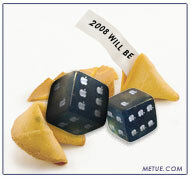 We all want to know: what promise and surprise does the 2008 product pipeline have in store for us?